It sounds crazy, but we've had to expand our menu at Reserva Las Gralarias to include worms! RLG's Latest Menu Item: Worms! Our kitchen at Reserva Las Gralarias is well-known for its Ecuadorian and international cuisine. But lately, we've had guests requiring different fare: worms! For several years, RLG caretaker, Segundo Imba, has been successful at feeding some of our antpittas. This type of endeavor has now become fairly common at various birding lodges but, for numerous reasons, was never anything that we actively tried to do at RLG. 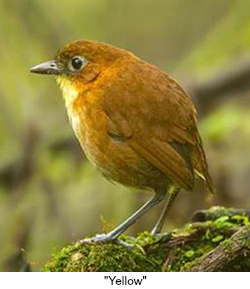 One day, though, I saw a Yellow-breasted Antpitta (YBA) in a garden behind the kitchen. When a few days later several of us saw one in front of the kitchen, we decided to throw a few worms to it in hopes of keeping it nearby and easy for our birding guests to see. Named “Yellow” by Segundo, that bird became a regularly photographed celebrity here at RLG. "Yellow” eventually moved down towards the creek though continues to call his very identifiable version of a typical YBA song. Just when we were ready to take worms off the menu, in early August this year, a Moustached Antpitta appeared near the entry gate and in front of the kitchen. So of course we have had to feed it also. Worms are back! In late August, we were happy to host at RLG a group of dedicated bird photographers from the island of Taiwan and mainland China. They shared their Chinese tea with us and seemed to be happy with our Ecuadorian/international cuisine. Most importantly they were able to see and photograph a lot of our most photogenic bird species. 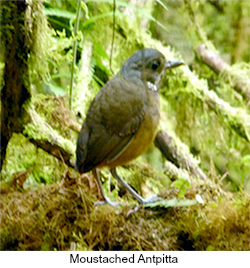 And, yes, they were able to get photographs of both Yellow-breasted Antpitta and Moustached Antpitta. 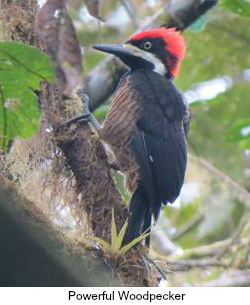 Some other nice sightings in August included a very territorial male Powerful Woodpecker at the guest house, our always-favorite Plate-billed Mountain-Toucans, many tanagers at our fruit feeders including the timid Blue-capped Tanager, and, for those who ventured out at night, an adorable family of Rufous-headed Pygmy-Tyrants. All in all, we've had a busy summer at RLG! If you missed some of our exciting sightings, catch up on all the goings-on at LGF's Recent News page on our website. First of all, we want to thank all of you for your fantastic support of Las Gralarias Foundation! And we know you'll enjoy knowing that whatever you donate to Las Gralarias Foundation, 100% of your donation is used to support the ongoing work at Reserva Las Gralarias. Board members and volunteers receive no compensation at all from Las Gralarias Foundation for their contributions of time and effort and cover the costs incurred by the foundation at their own expense. Since its inception, the Las Gralarias Foundation has raised funds to help purchase over 1,000 acres, or 425 hectares, of habitat. Contribution dollars have also been spent to help build a research station, purchase equipment for use in research, award small stipends to researchers, and buy supplies for the Los Exploradores education program. Because we depend on your support--as does the wildlife like the Powerful Woodpecker that has found a home at the reserve--we wanted you to know of a change. We recently learned that Just Give has merged with another organization and as a result they are no longer accepting donations on behalf of non-profit foundations, including Las Gralarias Foundation. So if you go to the Just Give website, LGF no longer comes up in a search result.